No quilt is complete without binding. Ashley Hough and Toby Lischko demonstrate how to attach a traditional binding using both machine and hand stitching, how to bind a curved edge, how to make a flange binding and how to fold the backing around the edge of a quilt to create a binding. Learn how to make a Christmas wreath wall hanging with Ashley Hough, just in time for the holidays! Ashley Hough demonstrates two distinct techniques for paper piecing in this exclusive class. Three templates are available for GOLD members to paper piece along with Ashley. Learn how to make a hexagon kaleidoscope quilt block using a 60-degree triangle template or the 60-degree line on your quilting ruler. Ashley Hough will demonstrate how to arrange the blocks into three different variations and then how to assemble the pieces of the hexagon. 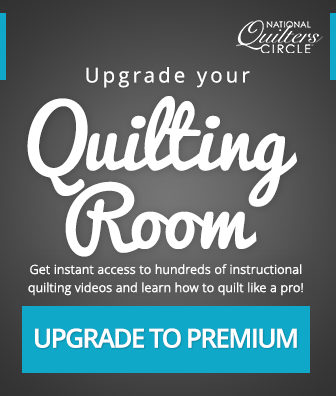 NQC editor Ashley Hough demonstrates a special, useful quilt as you go technique. 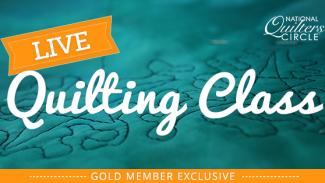 NQC editor and all around quilting expert Heather Thomas teaches you all about the fine art of hand beaded quilt embellishments in this NQC GOLD LIVE class. NQC editor and all around quilting expert Heather Thomas talks about the fine art of hand-beaded appliques. She reveals her best tips, tricks, and techniques regarding hand-beading for quilts.